Thought for the Day & Reminder! We are connected beings having a separate experience. Don't forget our final Fatima Family Holy Hour for World Peace, this Friday! I will be at the World Apostolate of Fatima in Asbury, NJ, but the show will go on right here on this blog! Don't miss it! And please add your voice to our comments-thank you, you will be blessed! CFM:) PSSpread the word and think about giving Our Lady a special gift for this momentous occasion! O Jesus, we thank Thee for this beautiful 100th Anniversary of Our Lady's fourth appearance to the three holy children at Fatima, Portugal. We thank Thee for our togetherness today all over the world in this joyful celebration. We light this candle for the intention of reparation to Thy Mother's Immaculate Heart, which we celebrate during this month of August, which so grieves over the sins of the world at this present hour. We especially wish to console her for the terrible injustice to unborn children, for she is Mother to all. May these little lights of ours ascend to her Queenly throne in Heaven and show her that indeed, there is still love for her on earth. Love for Thy Mother always directs us to Thee, O Jesus, our Savior, Whom she holds up to the world in her loving arms. Forgive us our sins and let us enter into this Holy Hour in a spirit of contrition and spiritual communion with Thee. We pray for peace in all the world and protection of all the innocent. We offer as well, all the intentions of those participating. We honor as well, Our Lady's glorious Assumption into Heaven, which we celebrate this coming week. Amen. As August 13th approached, the story of the apparitions had reached the anti-religious secular press, and while this ensured that the whole country knew about Fatima, it also meant that many biased and negative reports were circulating. The children were apprehended on the morning of August 13th, before the apparition could take place, by the Mayor of Vila Nova de Ourem, Arturo Santos. They were interrogated about the Blessed Mother's Secret she had given them, but despite threats and promises of money, they refused to cooperate. They were moved to the local prison and threatened with a horrible death, but determined that they would die rather than reveal the Secret. At Cova da Iria, thunder, followed by lightning, was heard at the usual time. The spectators noticed a small white cloud that hovered over the oak for a few minutes. Phenomena of coloration were observed on the faces of the people, the clothing, the trees, and the ground. 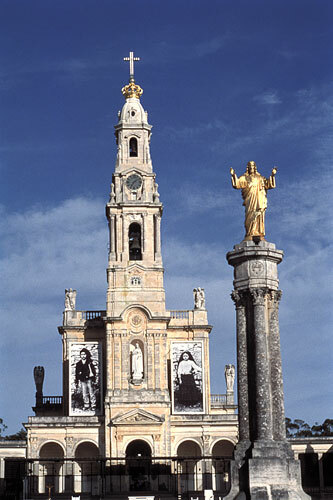 On August 19th, Lucia, Francisco and Jacinta were together at a place called Valinhos, near Fatima, when they again saw Mary, who spoke to Lucia: “Go again to the Cova on the 13th of next month and continue to say the Rosary every day.” Mary also said she would soon perform a miracle, so all would believe. Looking very sad, Mary then said: “Pray, pray very much, and make sacrifices for sinners, for many souls go to Hell because there are none to sacrifice themselves and pray for them.” With that, she rose into the air and moved towards the east before disappearing. By now, the children had thoroughly absorbed Mary’s plea for prayer and penance, and did everything they could to answer it. They prayed for hours while lying prostrate on the ground and went as long as they could without drinking in the burning heat of the Portuguese summer. They also went without food as a sacrifice for sinners to save them from Hell, the vision of which had so profoundly effected them. They even knotted some pieces of old rope around their waists as a form of mortification, not removing them day or night. Text courtesy World Apostolate of Fatima, USA and America Needs Fatima, slightly edited. Thank you for joining us! See you in September! Let us show Our Lady how much we love her! My son is home from college...he was just remarking on my strangeness. He said, "I wouldn't have you any other way, except a little bit different." Yay. This is the summer I have to look forward to. Holy Church dedicates this month to Our Lord's Sacred Heart, His actual LOVE for us! It is a Love which must be reciprocated. And we know the way to reciprocate it...by conforming to His Holy Will. The feast of His Sacred Heart is the 23rd, and the very next day is the feast of His Mother's Immaculate Heart! They cannot be separated-they are of one fiber. In addition, we have Corpus Christi and the Eucharistic Heart of Jesus this month. A great month to perform Sacred Heart devotions and read up on the life of Saint Margaret Mary. If you have not celebrated the Five First Saturdays, if you start this month, you'll still complete them during the six-month Fatima apparitions time frame. Of course, this devotion was given to Sister Lucia, the oldest of the Fatima seers, who lived to a ripe old age, while the other two died very young. We have the glorious feast of Pentecost and the Ember Days during Pentecost Week-let us offer these days for the coming season of summer, to be safe and fruitful for all the world. This blog features both old and new feasts. This is a picture of our "Lady of Fatima" statue in our dining room, along with the candle we used for the "Candle-Lighting." This statue, like our outdoor statue, shown in the "May" post, has an interesting history, also mysterious in nature. Again, too long of a story to get into right now.....but to make a long story short, it was in our home when I was a child, given away to the Catholic school I had attended, and made its way back to me about 25 years later. The little plaque on the bottom of the statue unfortunately was gone-it was in memory of my father, who passed away from a heart attack when I was 7 years old-he loved the story of Fatima. The head had broken off as well, but some wonderful person repaired it. They could have disposed of the statue and I would never have seen it again, but whoever it was, took the time to lovingly repair it with great care. I am so grateful! I cherish this statue with all my heart. She is wearing a pink mantilla of mine, which I am privileged to share with her. I felt for the Fatima Centennial, that she deserved some special ornamentation. The candle, I recently bought at a dollar store in a Latino neighborhood, and the dish it is on was given to me as part of a set, as a wedding gift by my godmother, whose name was Mary (may she rest in peace). I just wanted to share this with all of you. You could make your own similar set-up for our next Holy Hour, June 13th! Speaking of the next Holy Hour, I am re-thinking the promotion of it and some of the details of how it will work. The format will remain the same. I do hope to have more comments next time, but if not, even if we don't get any, I know at least 2 people will have prayed the Holy Hour-me and my husband! We actually completed it in a half-hour, but "Fatima Holy Half-Hour" just doesn't have a great ring to it! I don't really want to make it much longer-I want it to be easy for people and if you want to take the ball and run with it, adding or subtracting, that is fine. Nomen Christi seeks to empower people, not to dictate to them. Also, you really could do this at ANY time. The Fatima Centennial lasts all year. See you next month, and please contact us if you would like email reminders. I felt very enriched by doing this and I hope that it will be a blessing to others as well over the next 6 months!